The Healer class is a class designed for low-magic settings to provide healing and restoration through non-magical means. It relies heavily on medicines derived from herbs. 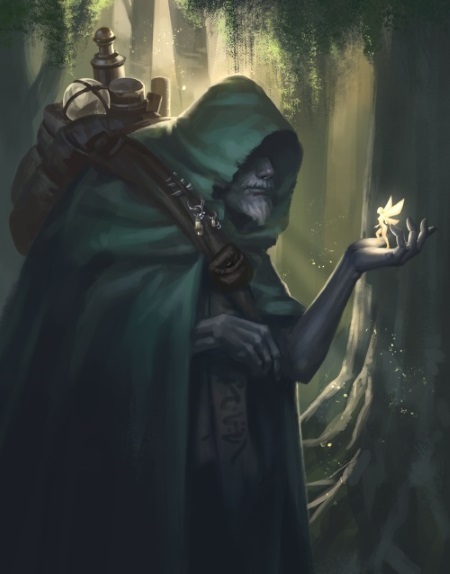 To play this class most effectively you should use a list of herbs for your setting that this class can forage for and prepare as medicines. For example, the Middle-earth setting could use this list of herbs. The Healer class provides little combat benefits, which may make playing this class more difficult in typical dungeon-crawling play. However, in the absence of magical healing the Healer plays an important role in keeping the party healthy and alive. Skills: Medicine, and choose two from Insight, Investigation, Nature, Perception. Medicine pack. A large supply of advanced tools and medical supplies. Proficiency is required to understand and use this equipment effectively. It functions as an herbalism kit, a poisoner's kit, and a healer's kit with an unlimited number of uses. It weighs 10 lbs and costs 50 gp. At 1st level you've learned to tend to basic wounds. When you take a short or long rest you may choose one willing creature that is taking a rest or that is unconscious, and expend one use of a healer's kit to tend to their wounds. You restore to that creature a number of hit points equal to your healer level plus your Wisdom modifier (minimum of 1), and remove one of the following effects: blinded, deafened, incapacitated, or stunned. You may only use this ability once during a rest (you still gain the benefits of the rest). This ability has no effect on undead or constructs. At 1st level you've begun the study of botany. When you forage for herbs or prepare them using an herbalism kit you may apply your proficiency bonus twice. At 2nd level you've learned how to return a creature to consciousness. As an action you expend one use of a healer's kit to awaken a living, stable creature that you can see and touch. If the creature has 0 hit points they instead have 1 hit point. Once you use this ability you cannot use it again until you complete a short or long rest. This ability has no effect on undead or constructs. At 2nd level you're able to diagnose most diseases and identify the presence of most poisons. By examining a substance or an affected creature for 1 minute and expending one use of a healer's kit you identify one poison or disease affecting the creature or present in the substance. If it is a rare poison or disease the DM may ask for an Intelligence check, which you have advantage on. Once you use this ability you may not use it again on the same substance or creature until you complete a long rest. At 3rd level you choose the healing path to specialize in: Herbalist or Physician, both detailed at the end of the class description. Your choice grants you features at 3rd level and again at 6th, 11th, 14th, and 17th levels. When you reach 4th level, and again at 8th, 12th, 16th, and 19th level, you can increase one ability score of your choice by 2, or you can increase two ability scores of your choice by 1. As normal, you can't increase an ability score above 20 using this feature. At 5th level you've learned to quickly analyze the anatomy of larger creatures to identify their vital points. You may use your action to observe a target creature within 60 feet that you can see clearly and that is at least one size larger than you. Subtract 1d4 from your Wisdom modifier (minimum of zero): this is the number of vital points you identify. You may share this information with others, communicating no more than one vital point on each of your turns. use their reaction to defend the target creature against an attack if they are within 5 feet of the creature, reducing the attack's damage by the number of vital points they know (maximum 5). Once you use this ability you may not use it again on the same creature until you complete a short rest. This ability may not target undead or constructs. At 7th level you can treat critical conditions quickly. Choose a creature that has zero hit points. As an action you may expend one use of a healer's kit to restore hit points equal to your Wisdom modifier (minimum of 1). This ability has no effect on undead or constructs. At 9th level you have learned techniques for reviving the recently-deceased. As an action you expend one use of a healer's kit and spend one hit dice from your hit dice pool to resuscitate a creature that has died within the last minute. You make a Wisdom (Medicine) check against a DC equal to 10 + the number of rounds that have passed since the creature died. If the check fails, then the creature remains dead. If the check succeeds the creature returns to life with zero hit points, unconscious, and dying; reduce one of the creature's ability scores by 1, remove all previously recorded death saving throws from the creature, and begin the dying process again. This ability has no effect on undead or constructs. At 10th level you can quickly bind serious wounds and treat critical conditions. During a short or long rest you expend one use of a healer's kit to tend to one willing creature's wounds (you still gain the benefit of the rest). All conditions except petrified, charmed, and poisoned are removed, and the creature may roll hit dice equal to your Wisdom modifier (minimum of zero) to regain hit points without expending any hit dice from their pool. You may only use this ability once during a rest. This ability has no effect on undead or constructs. At 13th level you can break the most dire fevers and illnesses. You spend a long rest treating a creature for an identified disease (you do not get the benefit of the long rest). At the end of the treatment expend one use of a healer's kit and make a Wisdom (Medicine) check adding the creature's Constitution bonus to your result. If the result succeeds against a DC equal to the number of days that the creature has been infected, then the disease is removed. If the result fails, then you have advantage on your next attempt. After you use this ability you cannot use it again until you complete a short rest. This ability has no effect on undead or constructs. At 15th level working with strong concentrations and antitoxins has strengthened your resistance to poison. You have resistance to poison damage and advantage to saving throws against poisons and their effects. At 18th level you have learned to heal the most virulent and dangerous diseases. You are immune to non-magical disease. In addition, you may expend one use of a healer's kit and spend a short rest treating a creature for an identified disease (you do not get the benefit of the short rest). At the end of the treatment the disease (magical or mundane) is removed. At 20th level you have developed a supernatural ability to heal by simply touching a wounded creature. As an action you may spend any number of hit dice from your pool and roll them to restore that many hit points to a chosen creature you touch. This ability has no effect on undead or constructs. At 3rd level, you have access to an herb garden in your hometown or city. Determine what type of terrain your home is in. Once per season you may obtain three doses of any kinds of herbs for your terrain when you visit your hometown or city. At 6th level you may obtain five doses each season; at 9th level you may obtain seven doses; at 12th level, nine doses; at 15th level, twelve doses; at 18th level, fifteen doses. You also have advantage when foraging in any terrain of the same type as your home terrain. At 6th level you've learned how some plants benefit from each other's byproducts. When you find an herb by foraging you may immediately make another foraging attempt with advantage to find a different type of herb. After using this ability you cannot use it again until you complete a short rest. At 11th level you have mastered the techniques for effectively preparing herbs for medicinal or other use. You have advantage on all Intelligence checks for preparing herbs. At 14th level you have developed techniques of preparing medicines that lengthen their effectiveness. Effects of herbs that you prepare have twice the stated duration. At 17th level you have learned to extract more usable concentrations from every herb. When using an herbalism toolkit to prepare herbs, your preparation results in three usable doses instead of one. At 6th level you may learn two of these details when you use this ability; at 9th level you learn three; at 12th level you learn four; at 15th level you learn five; at 18th level you learn six. You may not use this ability again on the same creature, and once you use this ability you may not use it again until you complete a short or long rest. This ability has no effect on undead or constructs. At 6th level you have learned to treat creatures to counteract the effects of venoms and poisons. You may perform the treatment during a long rest (with advantage), a short rest, or in 1 minute (with disadvantage) on a creature you can see and touch, and you expend one use of a healer's kit. At the end of the treatment you make a DC 10 Wisdom (Medicine) check, and if successful the poison is removed and its effects end. If you fail the check then the creature may add your Medicine bonus to any saving throws against the poison's effect until the poison is removed in another way. You may not attempt to use this ability on the same creature until you complete a long rest. This ability has no effect on undead or constructs. At 11th level you have specialized in the physiology of a chosen race. Choose one race (Dwarf, Elf, Human, etc.). You have advantage on Wisdom (Medicine) checks related to that race, even if it concerns a creature that is only "half" that race. At 14th level you learn to see how injuries affect the balance, range of motion, and sensory awareness of creatures. When a creature within 10 feet that you can see has less than their maximum hit points and attacks you, you may use your reaction to give it disadvantage. This ability has no effect on undead or constructs. At 17th level you have learned restorative surgical techniques. Choose an attribute to restore for a creature that has had an ability reduced. During a long rest (which you do not benefit from) you perform a surgery expending five uses of a healer's kit. After the long rest make a Medicine check with DC equal to 10 + the number of attribute points to restore, adding the creature's Constitution modifier to the check. If successful, the attribute points are restored. On a failed roll only half the points are restored (round down), and the creature gains a scar, limp, stutter, or other descriptive characteristic chosen by the DM. After you use this ability you cannot use it again until you complete a long rest. This ability has no effect on undead or constructs. This work by http://zerohitpoints.com/ is licensed under a Creative Commons Attribution-NonCommercial 4.0 International License except where otherwise indicated. The Zero Hit Points logo is a trademark of Zero Hit Points. Zero Hit Points is not affiliated with Wizards of the Coast LLC or Hasbro, Inc.